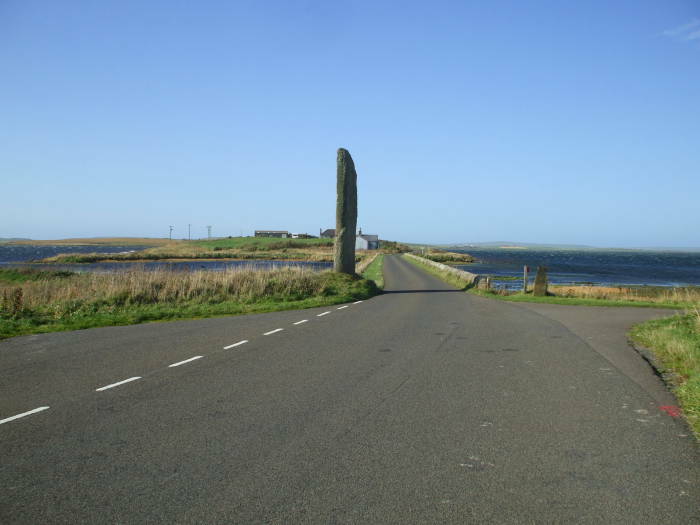 The Watch Stone is a megalith standing 5.6 meters above the ground, just northwest and outside the henge of the Stones of Stenness The Watch Stone is at the south end of a short causeway between Loch Stenness and Loch Harray. 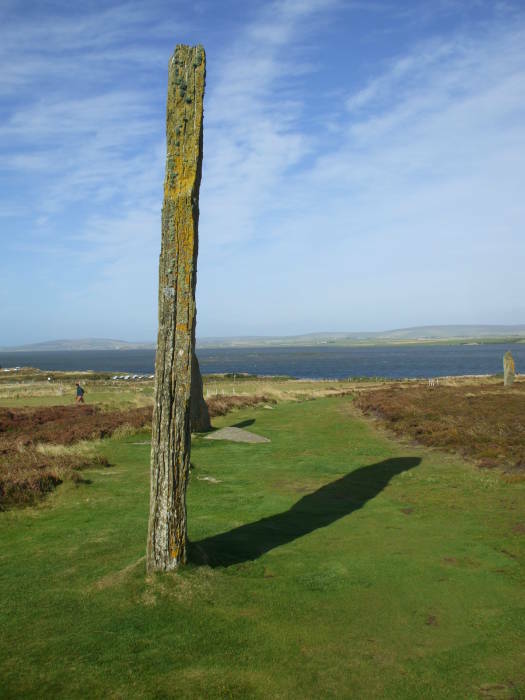 It points the way to our next destination, the Ring of Brodgar. We will continue northwest past the Watch Stone and along the B 9055 road. That follows the Ness of Brodgar, a peninsula, almost an isthmus, forming the route from the Stones of Stenness to the Ring of Brodgar. 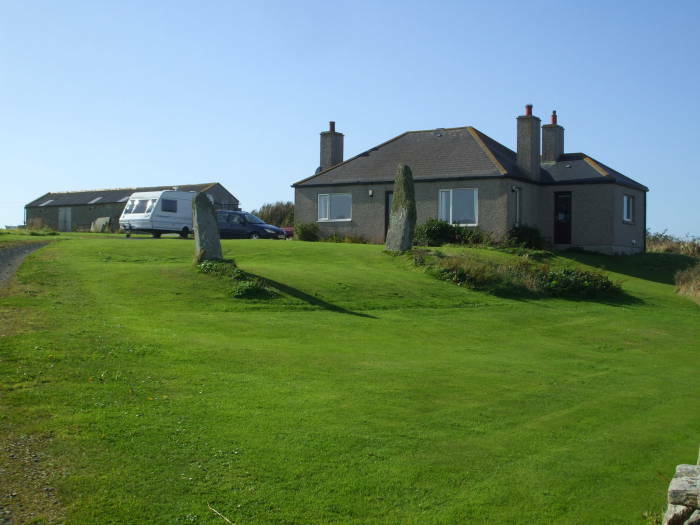 There are standing stones, tumuli, and cairns all over Orkney. Some people even have some Neolithic monuments in their yards! Then there's this house, home of Ola and Arnie Tait. The article "Neolithic Europe's Remote Heart" in Archaeology magazine, Jan/Feb 2013, pp 38-44 describes how they turned up a notched stone slab while plowing in the meadow directly behind the house. This led to the excavation of a large Neolithic complex occupied for a thousand years around 3300-2300 BC here on the Ness of Brodgar between the Stones of Stenness and the Barnhouse settlement to the south and the Ring of Brodgar to its north. Buildings were constructed on top of earlier ones throughout the millennium of use. In 2013 archaeologists had only concentrated on about 10 percent of the site and only down to the floor level of the top layer of structures. Some of the buildings were domestic, others were ritual. Grooved Ware pottery has been found here, and it is believed that the style originated in Orkney and then spread south and west through Britain and Ireland. There is a large exterior wall around the complex, which is located between two major standing stone circles and not too far from the Maeshowe tomb. The design and location suggest a powerful spiritual role for the complex. 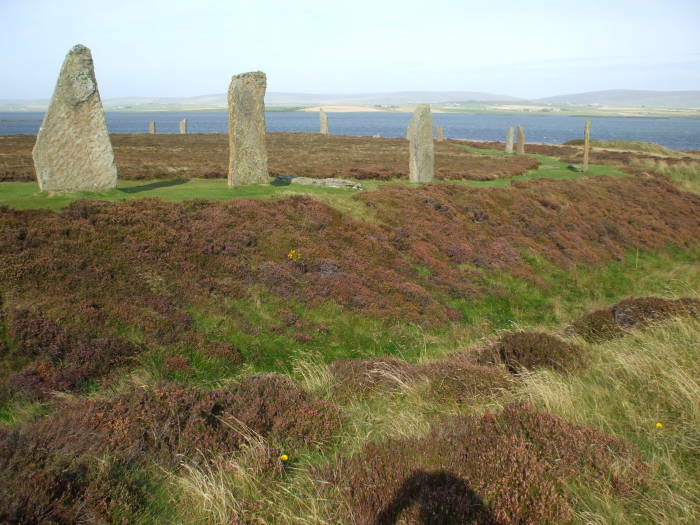 One possible interpretation, which I learned from an archaeologist in a pub back in Stromness, is that the complex formed a symbolic barrier between the ritual landscape of the Ring of Brodgar and the mundane world surrounding it. Or, given that there is further ritual landscape to its south, a symbolic barrier within a series of passages between different ritual landscapes. Earlier oval shaped buildings seem to have been replaced by rectilinear structures with internal stone "piers" dividing them into rectangular alcoves. These buildings are three to four times the size of those at Skara Brae, about 8 kilometers to the northwest on the outer coast. They have hearths and also have the "dressers" or stone cabinets or altars found at Skara Brae. Unlike the other buildings found so far, these have interior decorations in the form of geometric carvings and the traces of red, white and black paint made from local minerals mixed with egg whites or animal fat. These are the earliest painted walls found in northern Europe. Some structures have slate roofs, in contrast to the usual thatch. About 2500 BC they began building an unusually large building, about 25 by 20 meters with walls about 4 meters thick. Flagstones covered a large pavement surrounding the building and a large forecourt in front of it. Inside was a square central chamber about 8 by 8 meters in size. All the stone was carefully dressed. The Ring of Brodgar soon comes into view on the horizon as we continue north along the small road. There are outlying standing stones and tumuli well outside this major henge. 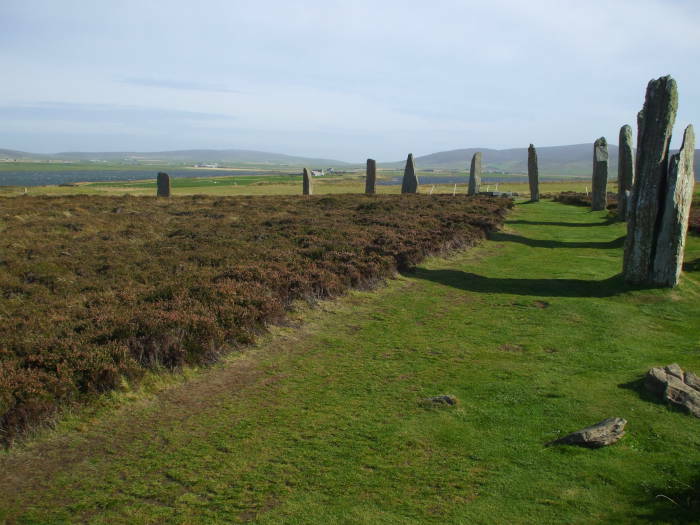 The Ring of Brodgar is a megalithic circle surrounded by a henge consisting of a circular ditch and earthen bank. 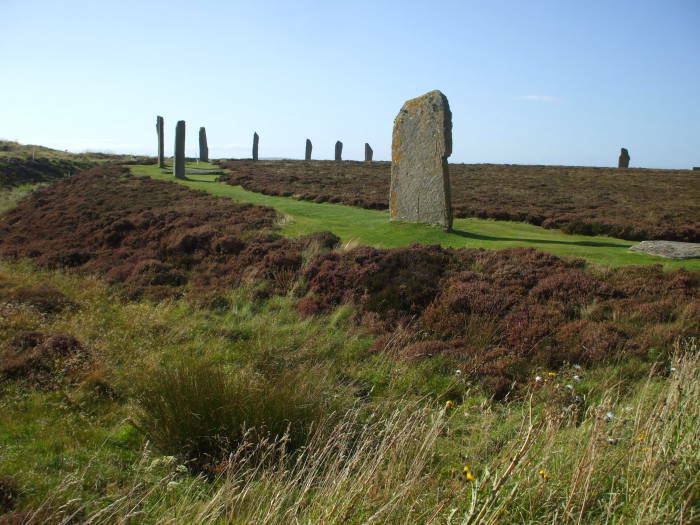 The stone circle is 104 meters in diameter, originally with 60 megaliths, standing 4.5 meters above ground level. Only 27 remain standing today. The surrounding ditch is three meters deep and ten meters wide. It is estimated that the ditch alone required 80,000 man-hours to construct. 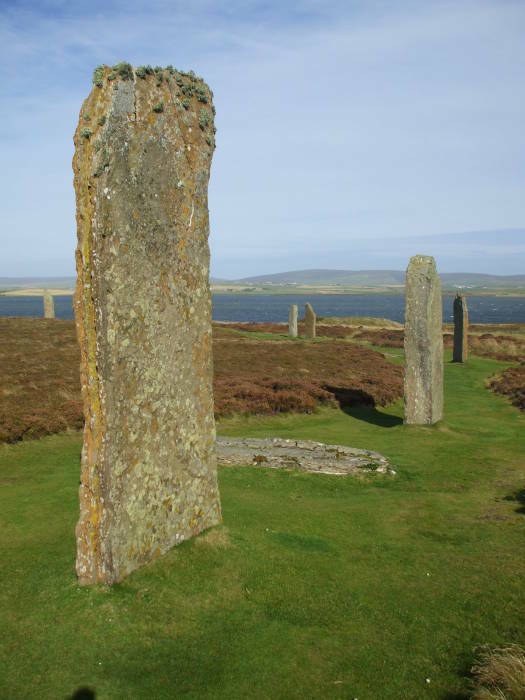 The Ring of Brodgar is generally thought to have been built between 2500 BC and 2000, so from 600 to 1100 years after the smaller circle of the Stones of Stenness. This would make it the last of the great Neolithic monuments built in this complex. Orkney College began scientific excavations in the 2010s at the Ness of Brodgar site between the Ring of Brodgar and the Stones of Stenness. These have unveiled several buildings, a mix of dwelling and ritual space. The earliest of those was built between 3,300 and 3,200 BCE. Some of the buildings were painted in shades of yellow, orange, and red using pigment made from haematite mixed with animal fat, eggs, or milk. Others had thin flagstone tiles on their roofs. These were the first instance of painted building decoration and tile roofs in the British Isles. The site was abandoned and partially dismantled by 2,200 BCE. The closing ceremony involved the slaughter of several hundred cattle in a single event. 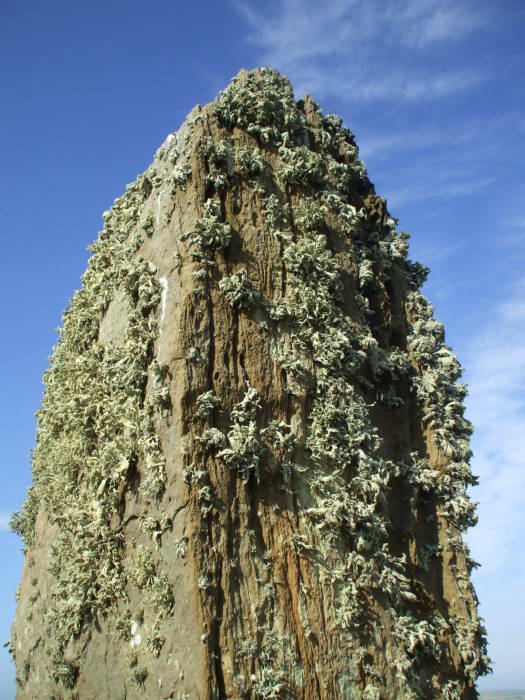 Lichens grow on many of the megaliths. 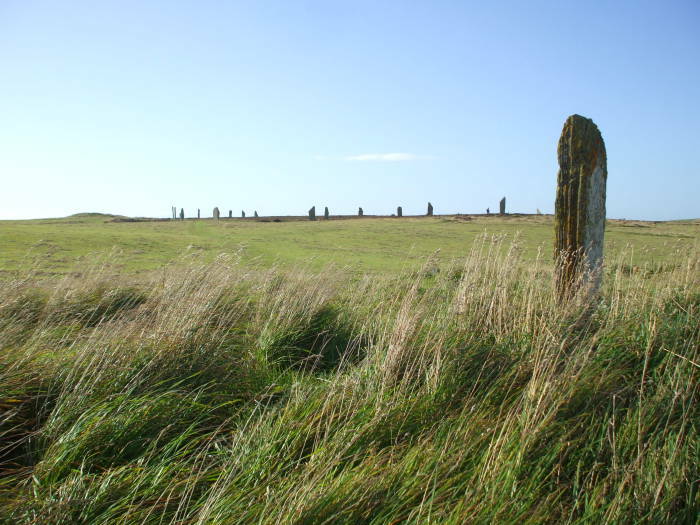 Supposedly some of the Norse invaders in the 9th century imposed their theology on the monuments, referring to the Ring of Brodgar and the Stones of Stenness as the Temple of the Sun and Temple of the Moon, respectively, with young people making vows and praying to Wōden. The more fanciful details of Norse rituals supposedly carried out here are thought to be no more than the speculation of overly enthusiastic 18th and 19th century antiquarians. But some of the stones at the Ring of Brodgar have runic carvings. 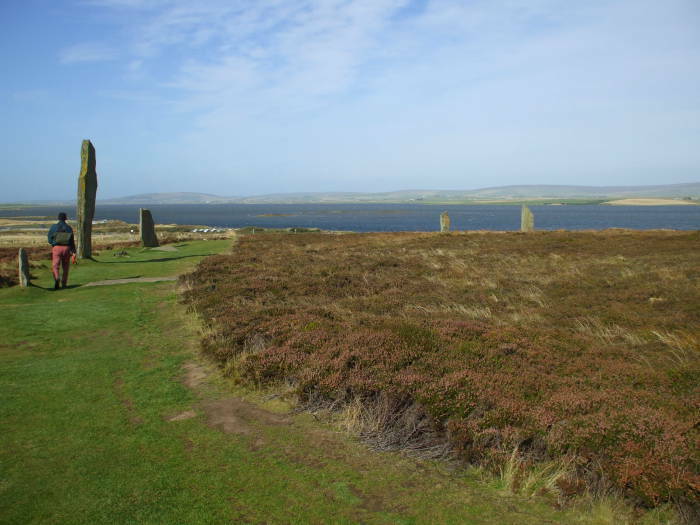 The peninsula leading south to the Stones of Stenness is at center. 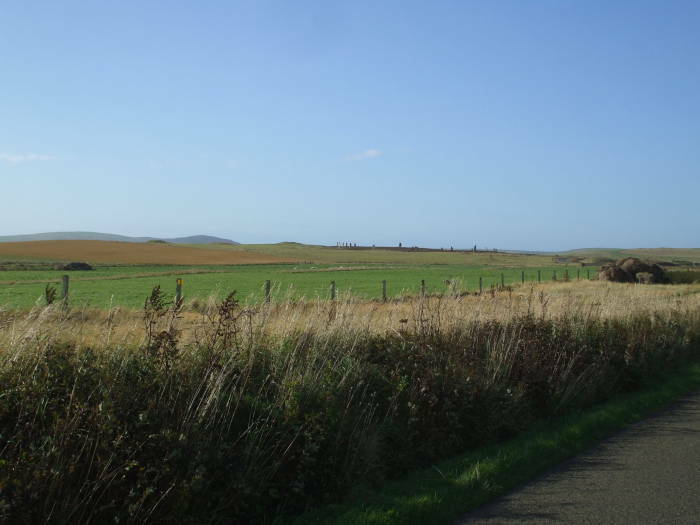 Maeshowe would be visible between the two leftmost stones in this view. These stones are nearly as unusually thin as those at the Stones of Stenness. 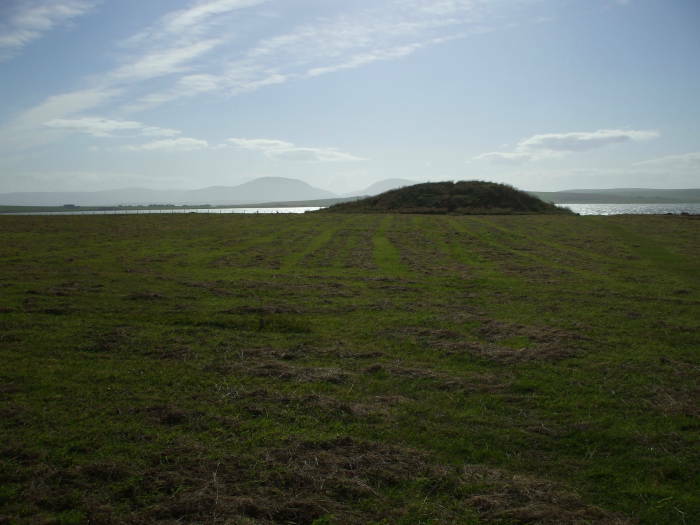 The Salt Knowe mound is very close, maybe a hundred meters outside the outer ring of the henge toward the shore of Loch Stenness. Those are the large hills on the island of Hoy in the distance, the highest points in Orkney.